Ashley is PolishAddicted: January Giveaway! Hello lovelies! It's time to announce my very first monthly giveaway! I am so excited for this! I hope you all like the prize, I think it's pretty awesome! There will be ONE winner and they will recieve a set of Nubar Polka Dots!! One Nubar Black Polka Dots and one Nubar White Polka Dots. I love these and I really hope you all do too! I am trying out Rafflecopter for this giveaway, it seems so much more fun and much easier than my previous giveaways! I have added in a TON of extra entry opportunities so let's get to it! This giveaway is open internationally, no matter where you live! It will be open starting today, January 11th and will close February 11th. I hope you enjoy! The white is gold and silver but so lovely anyway!! I don't have any Nubar's yet. I would love to add them to my collection. Thank you for the giveaway, lovely colors. Awesome giveaway! I haven't tried Nubar.. I know.. its sad. Awesome giveaway! I've never tried Nubar. I know.. its sad. white polka dots like the snow we are about to get!! black polka dots like what the snow looks like near march LOLOLOLOL! My comment disappeared I guess. Thank you so much for the giveaway, I'm keeping my fingers crossed! I had problems with filling the FB like of the rafflecopter because it asks me for my personal FB account name, I do follow you with my FB blog page account instead. Awesome set .... love this combo and I hope to win it hhahahahaaaa!!!!! Fantastic giveaway. Thanks for the chance in winning 2 great colors! Awesome prizes, Thank you so much!!! These are such cool polishes. Thank you! Thanks soooo much! I LOVE Nubar! Awesome giveaway! I've been drooling over these Nubar beauties for a while now. Awesome giveaway! Wish me luck! Hey Ashley thanks a lot for this great giveaway. Very nice Give away Ashley......super cool. Yay~ you're so sweet, my dear! I LOVE those Nubars!!!!! nice giveaway this is sure to make someone REAL happy.btw couldnt get twitter/ or facebook name in the boxes(?) not sure why. did those 2 social networks. i`ve never used nubar before because you cant get them in canada! LOVE Nubar!!! Great giveaway hashley! Thanks for the great giveaway! I think I might have accidentally put my Facebook link in the Twitter spot, if so - my apologies! Oops, I see what I've done - I put the facebook link in the BLOG link! I will put a link in my blog sidebar for giveaways, if that's okay. I love nail polish but I have never seen these. Must have!! OOoooooh yeah this is a GREAT giveaway! Whohoooo awesome polishes I hope to Win!! Awesome giveaway, I've wanted to try a Nubar polish for a while now! I have the public profile. but these days blogger is giving me problems and change it to private, please do not disqualify me, I can send a screenshot or something. Done all requested, I ope i did it right:) Thank you for this giveaway! found you thru jilltasticnaildesign on FB and so happy that i did. great stuff and hope to be the lucky one. 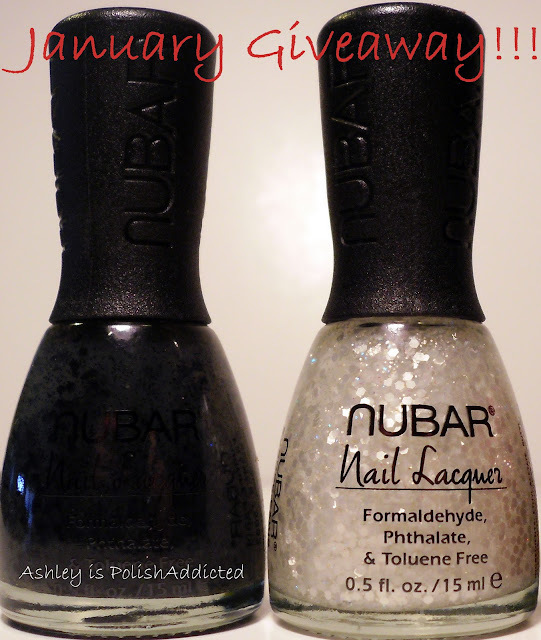 Love nubar . . great giveaway! Mini 500 Follower Giveaway Winner!! Holos and Frankens and Lynnderella's OH MY! Essence The Dawn is Broken with Stamping!!!! Holo Week Day 3!!! HITS Demeter! Guest Spot on Jen's Polish Wonderland! !